BIG Prizes to be Won for a Great Cause – Check it out! 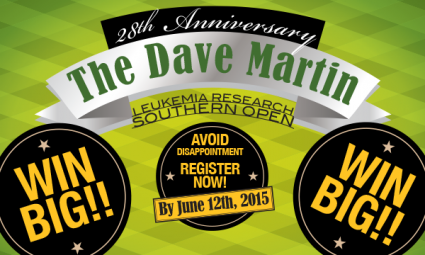 Once again, UFCW Local 401 is proud to announce the 28th annual Dave Martin Leukemia Research Southern Open golf tournament. Every year we raise thousands of dollars for leukemia and lymphoma research with this fun and fabulous golf tournament. Last year we raised $19,000 and we are determined to beat the amazing success of that tournament and set a new fundraising record this year. Hurry, there is still time to register and get in on the fun! This year, we want to raise more money for leukemia and lymphoma research than ever, so we’re sweetening the pot! Register by June 12th for your chance to win some VERY cool prizes. In addition to other great prizes we are giving away at the tournament, everyone who has registered by June 12th will be entered into a raffle to win an iPad Mini or iPod Shuffle. The 125th person who registers to take part in the tournament will automatically win a $125 gift card for the Paradise Canyon Pro Shop. There are numerous ways you can win even before you show up, so don’t miss out, register today! Check out the poster here for full details AND to fill out the registration form. We’d love to see you all there for a great fundraiser and social!